Former Arsenal star Santi Cazorla rolled back the years for Villarreal yesterday evening, scoring a spectacular goal in the Copa Del Rey against Almeria. Cazorla looks to be on the road to recovering from a horrible ankle injury which sidelined him for nearly two years, it’s amazing to see Cazorla continue his recovery from an injury which could have ended the star’s career. 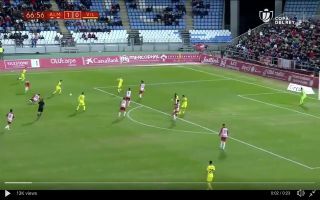 In the 67th minute of the clash Cazorla showcased immense close control to trick his way past two Almeria defenders before firing the ball into the top corner. The 33-year-old is considered a legend at the Emirates Stadium, Cazorla played 129 Premier League games for the Gunners and contributed an impressive 25 goals and 35 assists during his time in North London.